Pawan Sharma | September 7, 2011 | Linux Basics | RHCSA Objectives Be the first to comment! In this post we will discuss about the file system in RHEL 6. 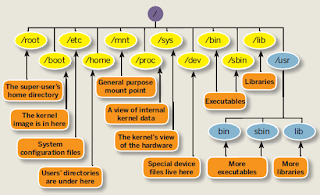 In Linux operating system there is a pre-defined location to store different files. The Linux file system can be defined as the method of storing and organizing files in a form that we can understand easily. In Linux operating system everything is a file. 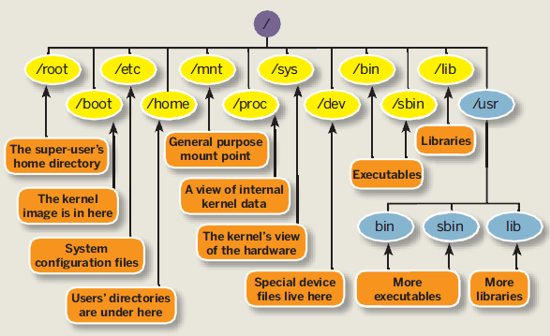 To manage all these files Linux have a tree like directory structure. File system is a method of storing and organizing arbitrary collection of data in a form that is human readable. / :- Root directory, which contains all other directories. /bin :- Contains commands that may be used by both system administrator and by users, but which are require when no other file-systems are mounted. /boot :- This directory contains everything which required for the boot process, like kernel, GRUB, Initrd, etc. /dev :- Contains device files. /etc :- Contains configuration files. /home :- Contains users’ home directories. /lib :- Essential shared libraries and kernel modules. /media :- Mount point for removable media. /mnt :- Mount point for temporary mounted file-system. /opt :- Contains add-on/optional packages. /root :- Root user’s home directory. /sbin :- Contains system binaries. /tmp :- Contains temporary files. /var :- Contains variable data files. /proc :- Contains kernel and process information.